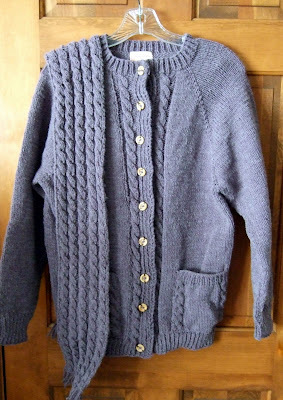 This woman's cardigan pattern is made with knitted worsted weight yarn on circular needles. I knit both sleeves at the same time to assure they will measure the same in the end. Since this is a raglan pattern, only the sleeve seams will need to be stitched. This pattern can be found in Leisure Arts "Knitted Seamless Raglans" leaflet 159, available on amazon.com. For the scarf, I simply knitted the same cable pattern that is found in the sweater until I reached the desired length. Your cardigan and scarf look great! About 3 years ago, my resolution was to learn to knit. While I have accomplished that goal, I haven't yet worked myself up to knitting a sweater...it may be on my list for this year, we'll have to see. you did a wonderful job. My mom also loves to knit cables. She says they're easier for her than straight knit one, pearl one. Jenn from JustAddWaterSilly.com hopping from antiprocrastination tuesdays. Learning to knit is on my bucket list - two of my daughters have taught themselves! Your sweater and scarf are lovely. thanks for sharing at Fridays Unfolded! Hi, I am stopping by from Madame Deals please come and visit my site and enter to win over $2000 in prizes including $100 in amazon giftcards. this is just beautiful! I know i took a lot of work. I used to knit but have not picked up my needles for awhile. Maybe I will. That is so beautiful. I love the color and love that you added a matching scarf. It must be so awesome to be able to just make something like that whenever you want! Thanks for linking up to Making Your Home Sing Monday. All of your sweaters are sooo cute...I wish I was so talented. Although I am recruiting my sister-in-law to try some of these out! I'm hosting a winter link party today and would love for you to link this up! I am a new GFC follower. 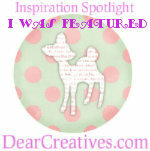 I found you on a blog hop. I would love it if you would follow me back please. Thank you.